You do not cry for Love. You cry only because you are feeling its absence. 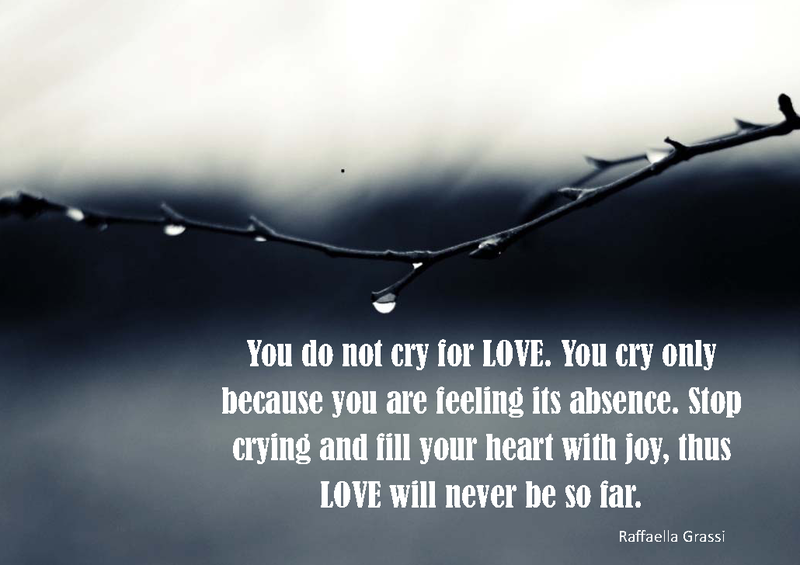 Stop crying and fill your heart with joy, thus Love will never be so far. From an empty heart I pray, because I feel so alone. What can I do that will show me I’m not. Caring more about what I give, rather than what I receive, connects me to what gives me life… love. And through this caring heart, comes a bouquet of the most extraordinarily scented flowers, that you want to share with everyone you meet. This is a heart that no longer needs, but gives. And through this giving heart, there is oneness, no aloneness. Coming from a full heart, prayer is a place of union, rather than one of needing and taking; separateness. There is a connection that’s comfortable, familiar… real. In this flow, what use to be designated times for prayer/ contemplation, becomes a never ending conversation. The word faith loses its usefulness, for its been replaced with trust. Unable to feel alone anymore, for you’ve been embraced… with a love like no other.